The mission of LARRS is to ensure that those who are print impaired have the same access to information as those who can read text. The Los Angeles Radio Reading Service is a project of Community Partners, a local non–profit corporation. LARRS is coordinated by people who are blind or who have worked in the field. The Los Angeles Radio Reading Service is comprised of a hearty staff of community volunteers who walk the extra mile. Throughout the year we enjoy many festivities and fundraising opportunities. Besides raising vital operating funds and raising awareness of our important mission, we also sieze the opportunity to get together and celebrate life! Whether it's a Rose Parade Broadcast or Helen Keller's Birthday Party, every single LARRS volunteer knows that what we bring to the community is quite special. The following event listings will give you an idea of what we're up to during the year. (Pictured right) is LARRS Chief Engineer Richard Blythe, who also serves as a commentator at our Anunual Rose Parade Broadcasts. The annual Rose Parade broadcasts are the highlight of the year for LARRS. Richard, along with a host of other community volunteers, gathers very early on New Year‘s morning at two seperate broadcast locations and provide detailed audio description of the proceedings. A chance to learn about the previous year's activities and successes. Jolie will discuss the progress made so far by LARRS and will outline her plans for the current year. We welcome new and current LARRS volunteers, their families, the folks behind the scenes, as well as anyone who is interested in the work that we do for the blind and visually–impaired here in the Southland. This session will be followed by a workshop for Evergreen Broadcasters training. A question and answer session to follow. Come join LARRS volunteers as we sell home–baked goods to raise funds in suport of our annual Helen Keller Birthday and Volunteer Appreciation Day! Bring your appetite and your checkbook! Outreach to local business to purchase and have their company name inscribed on (subcarrier) radios made especially for LARRS listeners. The radios will be donated to LARRS low–income listeners. Businesses to sponsor minimum of 10 (subcarrier) radios. Businesses can also donate $100.00 for a Von’s Foundation match..
LARRS celebrates the birth of the great American author, political activist, and lecturer Helen Keller. The recycling event could be a great Eagle Scout project. If you know of any potential eagle scouts at home, please contact LARRS ASAP! We also celebrate Helen Keller’s birthday and the birthday of LARRS on this day. It is also our day to celebrate and appreciate our wonderful volunteers. Bewitching hours of haunting stories read by your favorite celebrities and regular LARRS hosts! We are lining up 13 celebrities who will bewitch our audience during the 13–hour Scare–a–Thon! Hear them read their favorite ghostly tales from 11:00am to 7:00pm. Please contact LARRS if you know a celebrity that would like to participate. Lots of fun activities are being planned. .
Have you heard about “Giving Tuesday”? Giving Tuesday is a movement with a charitable twist on the annual traditions of Black Friday and Cyber Monday. Individuals, families and corporations are encouraged to support a charitable cause and give back on this day. An annual LARRS tradition. We broadcast live audio descriptions for the blind and visually–impaired of the Pasadena Tournament of Roses Rose Parade, presented by Honda, from our locations at the corner of Colorado and Orange Grove as well as down the route at Garfield Blvd. 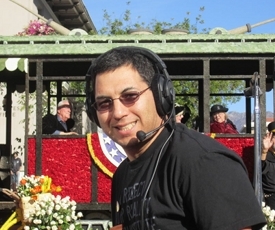 This unique broadcast service enables thousands of blind and sight impaired individuals across the nation the experience of The Rose Parade as made possible by commentators and audio describers.